The NHL’s latest controversy is all about equipment. Goal nets coming off their moorings have resulted in a couple of controversial plays over the last couple of weeks. This forced the NHL to put out a memo to teams and officials addressing the issue, but that’s not where this discussion ends. Let’s talk about where this whole thing started. Naturally, it all centers around the Toronto Maple Leafs. The Maple Leafs ran into two scenarios where the net coming off of its moorings either overturned a goal or prevented a scoring opportunity. 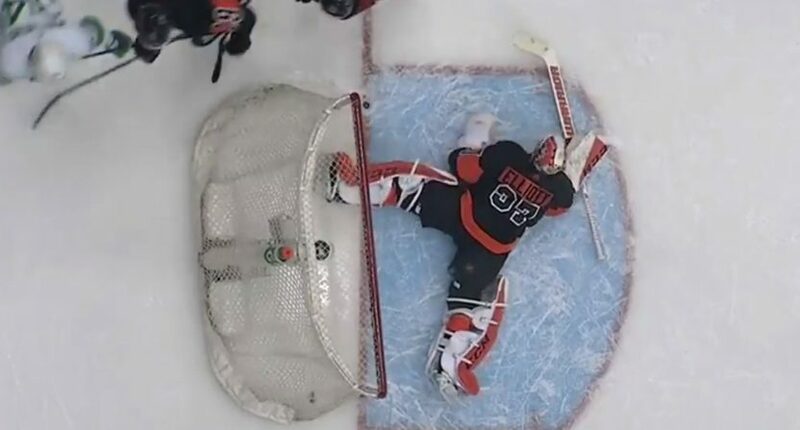 In both cases, the goaltender knocked the goal off of its pegs with relatively minimal contact. Whether either incident was intentional is up for debate. Regardless, the play was whistled dead and now the league is facing some heated scrutiny. Following the two plays, the NHL has reportedly sent a memo to all of the league’s teams and officials regarding the goal nets. Is it a coincidence that two very similar events happened so close together or is there an operational issue at play here? Some have suggested that the league needs to use larger pegs in order to secure the nets. That isn’t a reasonable solution given the huge injury risk that poses to the players. There are plenty of gruesome injuries (Mark Howe, for starters) that should end that discussion before it even begins. It’s possible the league needs to instruct the ice crew to clean out the peg area more regularly at stoppages. The nets have to give way with enough pressure, but also have to stay in place through the regular bumps and nudges that take place during a normal hockey game. That’s not an easy task. There isn’t a quick fix that can eliminate this problem. Some analysts believe that larger goaltenders have created a new problem that the NHL must now address. The belief is they’re dislodging the net as a tactic when pressure is mounting, but they’re doing it subtly enough to avoid punishment. Currently, a penalty can be assessed if it’s deemed a player or goalie intentionally knocked the net loose. A penalty shot can be awarded if the infraction occurs in the final two minutes. Is that enough? The league and its officials will surely remind everyone that players will be penalized if they’re caught dislodging the net. A couple assessed penalties or penalty shots could immediately crack down on future incidents. Of course, not every case is a clear example of intent. The two recent examples look relatively innocent. Assessing a penalty in either case could be viewed as overly harsh. This might just be an isolated issue that has been suddenly thrust to the forefront following a couple high profile incidents. Still, the league would be wise to look into future solutions. The last thing they want is a playoff game ending in a disallowed goal due to the net coming loose.